This article is about Thomas Mann's novella. For other uses, see Death in Venice (disambiguation). The main character is Gustav von Aschenbach, a famous author in his early fifties who has recently been ennobled in honor of his artistic achievement (thus acquiring the aristocratic "von" in his name). He is a man dedicated to his art, disciplined and ascetic to the point of severity, who was widowed at a young age. As the story opens, he is strolling outside a cemetery and sees a coarse-looking red-haired foreigner who stares back at him belligerently. Aschenbach walks away, embarrassed but curiously stimulated. He has a vision of a primordial swamp-wilderness, fertile, exotic and full of lurking danger. Soon afterwards, he resolves to take a holiday. After a false start in traveling to Pula on the Austro-Hungarian coast, Aschenbach realizes he was "meant" to go to Venice and takes a suite in the Grand Hôtel des Bains on the Lido island. While shipbound and en route to the island, he sees an elderly man in company with a group of high-spirited youths, who has tried hard to create the illusion of his own youth with a wig, false teeth, make-up, and foppish attire. Aschenbach turns away in disgust. Later he has a disturbing encounter with an unlicensed gondolier—another red-haired, skull-faced foreigner—who repeats "I can row you well" when Aschenbach orders him to return to the wharf. Aschenbach checks into his hotel, where at dinner he sees an aristocratic Polish family at a near-by table. Among them is an adolescent boy of about fourteen in a sailor suit. Aschenbach, startled, realizes that the boy is supremely beautiful, like a Greek sculpture. His older sisters, by contrast, are so severely dressed that they look like nuns. Later, after spying the boy and his family at a beach, Aschenbach overhears the lad's name, Tadzio, and conceives what he first interprets as an uplifting, artistic interest. Soon the hot, humid weather begins to affect Aschenbach's health, and he decides to leave early and move to a cooler location. On the morning of his planned departure, he sees Tadzio again, and a powerful feeling of regret sweeps over him. When he reaches the railway station and discovers his trunk has been misplaced, he pretends to be angry, but is really overjoyed; he decides to remain in Venice and wait for his lost luggage. He happily returns to the hotel and thinks no more of leaving. Over the next days and weeks, Aschenbach's interest in the beautiful boy develops into an obsession. He watches him constantly and secretly follows him around Venice. One evening, the boy directs a charming smile at him, looking, Aschenbach thinks, like Narcissus smiling at his own reflection. Disconcerted, Aschenbach rushes outside, and in the empty garden whispers aloud, "I love you!" Aschenbach next takes a trip into the city of Venice, where he sees a few discreetly worded notices from the Health Department warning of an unspecified contagion and advising people to avoid eating shellfish. He smells an unfamiliar strong odour everywhere, later realising it is disinfectant. However, the authorities adamantly deny that the contagion is serious and tourists continue to wander round the city, oblivious. Aschenbach at first ignores the danger because it somehow pleases him to think that the city's disease is akin to his own hidden, corrupting passion for the boy. During this period, a third red-haired and disreputable-looking man crosses Aschenbach's path; this one belongs to a troupe of street singers who entertain at the hotel one night. Aschenbach listens entranced to songs that, in his former life, he would have despised – all the while stealing glances at Tadzio, who is leaning on a near-by parapet in a classically beautiful pose. The boy eventually returns Aschenbach's glances, and, though the moment is brief, it instills in the writer a sense that the attraction may be mutual. Next, Aschenbach rallies his self-respect and decides to discover the reason for the health notices posted in the city. After being repeatedly assured that the sirocco is the only health risk, he finds a British travel agent who reluctantly admits that there is a serious cholera epidemic in Venice. Aschenbach considers warning Tadzio's mother of the danger; however, he decides not to, knowing that if he does, Tadzio will leave the hotel and be lost to him. One night, a dream filled with orgiastic Dionysian imagery reveals to him the sexual nature of his feelings for Tadzio. Afterwards, he begins staring at the boy so openly and following him so persistently that Aschenbach feels the boy's guardians have finally noticed, and they take to warning Tadzio whenever he approaches too near the strange, solitary man. But Aschenbach's feelings, though passionately intense, remain unvoiced; he never touches Tadzio, or even speaks to him; and while there is some indication that Tadzio is aware of his admiration, the two exchange nothing more than the occasional surreptitious glance. Aschenbach begins to fret about his aging face and body. In an attempt to look more attractive, he visits the hotel's barber shop almost daily, where the barber eventually persuades him to have his hair dyed and his face painted to look more youthful. The result is a fairly close approximation to the old man on the ship who had so appalled Aschenbach. Freshly dyed and rouged, he again shadows Tadzio through Venice in the oppressive heat. He loses sight of the boy in the heart of the city; then, exhausted and thirsty, he buys and eats some over-ripe strawberries and rests in an abandoned square, contemplating the Platonic ideal of beauty amidst the ruins of his own once-formidable dignity. A few days later, Aschenbach goes to the lobby in his hotel, feeling ill and weak, and discovers that the Polish family plan to leave after lunch. He goes down to the beach to his usual deck chair. Tadzio is there, unsupervised for once, and accompanied by an older boy, Jasiu. A fight breaks out between the two boys, and Tadzio is quickly bested; afterward, he angrily leaves his companion and wades over to Aschenbach's part of the beach, where he stands for a moment looking out to sea; then turns halfway around to look at his admirer. To Aschenbach, it is as if the boy is beckoning to him: he tries to rise and follow, only to collapse sideways into his chair. His body is discovered a few minutes later. Gustav von Aschenbach is introduced as an older famous author out for a walk in his hometown, Munich. As the clouds darken and a storm approaches, he encounters a red-haired man glaring at him, rousing a longing to travel to a place opposite to that where he resides. He believes the journey will improve his writing. The controlled childhood past of Gustav von Aschenbach led him to follow his parents' ideals and become well-known before he had the ability to experience the stages of growing up. He is depicted as having a weakened immunity yet able to battle through it as have the main characters in his novels. His adventure begins with a trip to the rainy Adriatic island, which does not suit Aschenbach's yearning for a wondrous new getaway, causing him to sail for Venice a few days after. On board the ship he experiences spells of dizziness as he watches those around him, in particular a group of men which appear to be young, but after close examination Aschenbach realizes one of them has used make-up, dentures, and a wig to conceal his age. When he arrives at his destination, which is again a disappointing darkness contrary to the sunlight he was expecting, this same old man drunkenly attempts to allure Aschenbach. Aschenbach transfers to a gondola headed in a suspicious direction by a criminal who later on disappears, and he likened the gondola to a coffin. Once at the hotel, Aschenbach notices a beautiful adolescent Polish boy during dinner, likened to Eros, the Greek god of love. He sees him again the next morning, later watching him play on the beach, and again riding the elevator. He discovers his name to be Tadeusz, and up close he is sighted as seeming ill, which causes Aschenbach to secretly relish in the idea of the boy dying early. Due to unfortunate weather conditions, Aschenbach decides to leave yet again, and sends off his luggage; after missing the train, he discovers his luggage was misplaced and therefore must stay in Venice a few days more. He sees the boy through his window and is delighted at having more time to spy on Tadeusz. Aschenbach receives his missing luggage, but chooses to stay and analyze every beautiful piece of Tadzeusz, giving him daydreams of Socrates pursuing his student Phaedrus. This seemingly parallels his own situation, as Socrates is unattractive and elderly, while Phaedrus embodies youth and beauty. After this he delighted himself in writing about Tadzeusz's body, later almost making contact with him at the beach. As he is overcome with his obsession, he metaphorically describes the surrounding nature as Greek gods, Tadzeusz being Hyacinthus. As he watches the boy, they lock eyes and Tadzeusz gives him a smile, to which Aschenbach realizes his love for the child. Signs of an epidemic appear as the public are warned to avoid the water and shellfish, less and fewer people, and German newspaper. Secretly, Aschenbach wishes for a quarantine so he may have more time fantasizing and stalking Tadeusz. He defends his obsession by depicting it as art. The Venetians, specifically a red-headed musician Aschenbach asks, attempt to conceal the fact that an epidemic is happening by stating the bactericide is being used only as a precaution, relating to his own obsession as he attempts to conceal it as well. At a British agency, Aschenbach discovers the epidemic is cholera, coming from India. The thought of leaving is soon dismissed by the fantasy of Tadeusz with him in quarantine. At night, he has dreams of humans in beast skins worshipping a Dionysian and perverted representation in a wooden statue, which are metaphorically himself worshipping his desires. When the cholera is uncovered, tourists leave, Aschenbach takes the opportunity to attract the boy by transforming into a figure mentioned earlier (the old man on the boat attempting to look youthful with make-up and a wig), relishing in the idea of everyone else dying and leaving only Tadeusz. Aschenbach masticates on rotten strawberries as he walks down the littered streets until he reaches the beach to watch Tadeusz playing rough with his friend. When the boy notices him, he smiles and points outward. Aschenbach, however, cannot rise to meet him, and dies. Mann's original intention was to write about "passion as confusion and degradation", after having been fascinated by the true story of Goethe's love for 18-year-old Baroness Ulrike von Levetzow, which had led Goethe to write his "Marienbad Elegy". The May 1911 death of composer Gustav Mahler in Vienna and Mann's interest in the boy Władzio during summer 1911 vacation in Venice (more below) were additional experiences occupying his thoughts. He used the story to illuminate certain convictions about the relationship between life and mind, with Aschenbach representing the intellect. Mann was also influenced by Sigmund Freud and his views on dreams, as well as by philosopher Friedrich Nietzsche who had visited Venice several times. The novella is rife with allusions from antiquity forward, especially to Greek antiquity and to German works (literary, art-historical, musical, visual) from the eighteenth century on. One important framework of references points to Greek mythology; Aschenbach's Venice seems populated by the gods. By dedicating himself to Apollo, whom Friedrich Nietzsche's The Birth of Tragedy took to represent restraint, form and the intellect, Aschenbach has denied the power of Dionysus, Nietzsche's god of unreason and of passion – a voluntary act of what Freud would call "suppression". Dionysus seems to have followed Aschenbach to Venice with the intent of destroying him: the red-haired man who keeps crossing von Aschenbach's path, in the guise of different characters, could be a figure of Silenus, Dionysus's mythological chief disciple. In the Benjamin Britten opera these characters (the traveller, the gondolier, the leading player and the voice of Dionysus) are played by the same baritone singer, who also plays the hotel manager, the barber and the old man on the Vaporetto. The trope of placing classical deities in contemporary settings was popular at the time when Mann was writing Death in Venice: in England, at almost the same time, E. M. Forster was at work on an entire short-story collection based on this premise. The idea of the opposition of the Apollonian and Dionysian was first proposed by Nietzsche in The Birth of Tragedy and was also a popular motif of the time. Aschenbach's name and character may be inspired by the homosexual German poet August von Platen-Hallermünde. There are allusions to his poems about Venice in the novella and, like Aschenbach, he died of cholera on an Italian island. Aschenbach's first name is almost an anagram of August, and the character's last name may be derived from Platen's birthplace, Ansbach. However, the name has another clear significance: Aschenbach literally means "ash brook". The novella's physical description of Aschenbach was based on a photograph of the composer Gustav Mahler. Mahler had made a strong personal impression on Mann when they met in Munich, and Mann was shocked by the news of Mahler's death in Vienna. Mann gave Mahler's first name and facial appearance to Aschenbach, but did not talk about it in public. (The soundtrack of the 1971 film based on the novella made use of Mahler's compositions, particularly the "Adagietto" 4th movement from the Symphony No. 5). Modris Eksteins notes the similarities between Aschenbach and the Russian choreographer Sergei Diaghilev, writing that, even though the two never met, "Diaghilev knew Mann's story well. He gave copies of it to his intimates." Diaghilev would often stay at the same hotel as Aschenbach, the Grand Hotel des Bains, and take his young male lovers there. Eventually, like Aschenbach, Diaghilev died in Venice. All the details of the story, beginning with the man at the cemetery, are taken from experience… In the dining-room, on the very first day, we saw the Polish family, which looked exactly the way my husband described them: the girls were dressed rather stiffly and severely, and the very charming, beautiful boy of about 13 was wearing a sailor suit with an open collar and very pretty lacings. He caught my husband's attention immediately. This boy was tremendously attractive, and my husband was always watching him with his companions on the beach. He didn't pursue him through all of Venice—that he didn't do—but the boy did fascinate him, and he thought of him often… I still remember that my uncle, Privy Counsellor Friedberg, a famous professor of canon law in Leipzig, was outraged: "What a story! And a married man with a family!" The boy who inspired "Tadzio" was Baron Władysław Moes, whose first name was usually shortened as Władzio or just Adzio. This story was uncovered by Thomas Mann's translator, Andrzej Dołęgowski, around 1964, and was published in the German press in 1965. Some sources report that Moes himself did not learn of the connection until he saw the 1971 film version of the novel. Władysław Moes was born on November 17, 1900 in Wierbka, the second son and fourth child of Baron Aleksander Juliusz Moes. He was aged 10 when he was in Venice, significantly younger than Tadzio in the novella. Baron Moes died on December 17, 1986 in Warsaw and is interred at the graveyard of Pilica, Silesian Voivodeship. He was the subject of a biography, The Real Tadzio (Short Books, 2001) by Gilbert Adair. The novella was probably first published in English in periodical form in The Dial in 1924 over three issues (vol. LXXVI, March to May, issues # 3–5, Camden, NJ, USA), as per an advertisement by Peter Ellis (Bookseller, London, UK) for sale of a copy of those issues (www.abebooks.com, viewed Feb 2, 2011). It was first published in book form in English in 1925 as Death in Venice and Other Stories, translated by Kenneth Burke. W. H. Auden called it the definitive translation. A new translation was published in 2005 by Michael Henry Heim which won the Helen and Kurt Wolff Translation Prize. A film of Death in Venice starring Dirk Bogarde was made by Luchino Visconti in 1971. Benjamin Britten transformed Death in Venice into an opera, his last, in 1973. The novella was also dramatised by Peter Wolf for BBC Radio 3 in 1997. It was made into a ballet by John Neumeier for his Hamburg Ballet company in December 2003. Stage production in 2013, directed by Thomas Ostermeier, at the Schaubühne theatre in Berlin, called Death in Venice/Kindertotenlieder, taking elements from Gustav Mahler song cycle Kindertotenlieder. Love and Death on Long Island (1997) starring John Hurt as a middle-aged writer who becomes obsessed with a young actor portrayed by Jason Priestley, based on Gilbert Adair's book. "Death in Venice" is the name of a cocktail invented by the British travel writer Robin Saikia, author of The Venice Lido. 'Ganymede', a short story by Daphne Du Maurier, about an Englishman's longing for a young boy in Venice, with tragic consequences. Published in 1959 as one of a collection of eight short stories in The Breaking Point (anthology). Annie Hall, 1977 film in which actress Diane Keaton tells Woody Allen that she prefers living in Los Angeles to New York City, which she finds dirty and dying and reminiscent of the book Death in Venice. Frank Donald Hirschbach, The Arrow and the Lyre: A Study of the Role of Love in the Works of Thomas Mann (The Hague, M. Nijhoff, 1955), passim (but especially the section "The Loves of Two Artists: Tonio Kröger and Death in Venice", op. cit., pp. 14ff.). T.J. Reed, Death in Venice: Making and Unmaking a Master. New York: Twayne Publishers, 1994. Lee Slochower, "The Name of Tadzio in Der Tod in Venedig", German Quarterly, vol. 35, No. 1 (January 1962). David Luke: "Thomas Mann's Iridescent Interweaving (1988)", in: Death in Venice: Thomas Mann. A New Translation, Backgrounds and Contexts Criticism. Translated and edited by Clayton Koelb, New York, London 1994. Seong Joo Lee: "The Reception of the Odyssey in Thomas Mann's Death in Venice", in: Germanic Notes and Reviews, Vol. 42, No. 2, Greenville SC, GNR 2011. Ehrhard Bahr: "Der Tod in Venedig, Erläuterungen und Dokumente." Reclam, Stuttgart 1991. ^ Letter to Carl Maria Weber dated July 4, 1920. In: Thomas Mann: Briefe I: 1889–1936, ed. Erika Mann. Fischer 1979. p. 176f. ^ a b Letter to Wolfgang Born dated March 18, 1921. In: Thomas Mann: Briefe I: 1889–1936, ed. Erika Mann. Fischer 1979. p. 185. Wikimedia Commons has media related to Death in Venice. 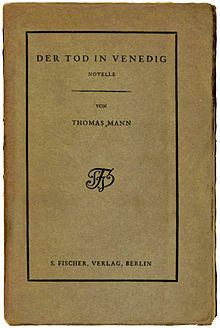 Der Tod in Venedig at Project Gutenberg — German language version. Michael Chanan, Mahler in Venice? Jones, James W. "Mann, Thomas (1875-1955): Death in Venice". glbtq.com. Archived from the original on February 4, 2015. Retrieved January 30, 2015.